Easy ergonomic loading of large and/or heavy Screen Frames. 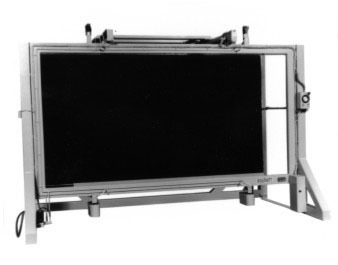 Load frame vertically on heavy duty steel support bar; motorized blanket frame moves toward glass frame; air locks seal frames; Douthitt Model 52 Air Pump provides perfect contact. Special Douthitt Deep Draw Black Blanket. Under vacuum this blanket swiftly molds itself to the shape of the Screen Frame and holds your positive in perfect contact. Douthitt Heavy Duty Model 52 Silent Air Pump. Compressed Air Powered Frame Locks to seal glass and blanket frames. Motorized opening and closing of vacuum blanket frame. Heavy Duty Steel Loading Bar.